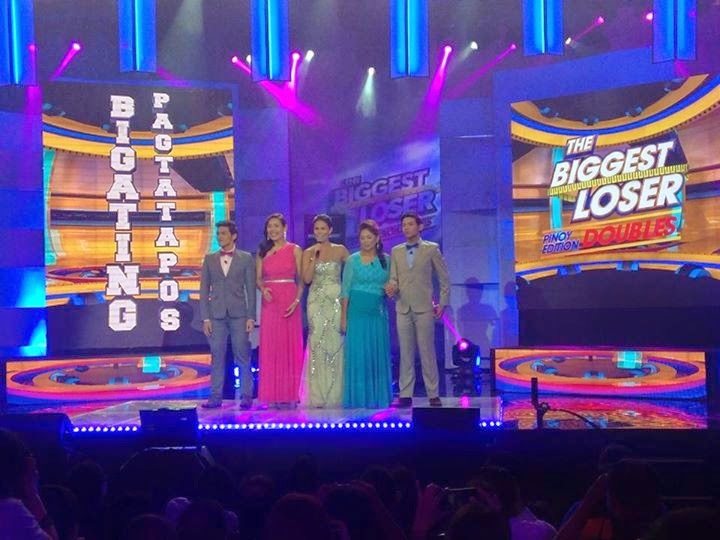 Manila, Philippines - Bryan Castillo of team 'Magkapatid' was named grand winner of The Biggest Loser Pinoy Edition Doubles on finale episode dubbed as "Ang Bigating Pagtatapos' on Saturday, April 26, 2014 at the Dolphy Theater, Quezon City. Bryan Castillo of Pembo, Makati received a business franchise package, home appliance showcase, P100,000 worth of sporting goods and accessories, lifetime gym membership and P1 million. Bryan Castillo has starting weight of 293 pounds and was able to lose 139 pounds or 52.56%. Meanwhile, Francis has starting weight of 305 pounds and has lost 149 pounds or 48.85%. Kayen Lazaro has starting weight of 287 pounds and was able to lose 145 pounds or 50.52%. 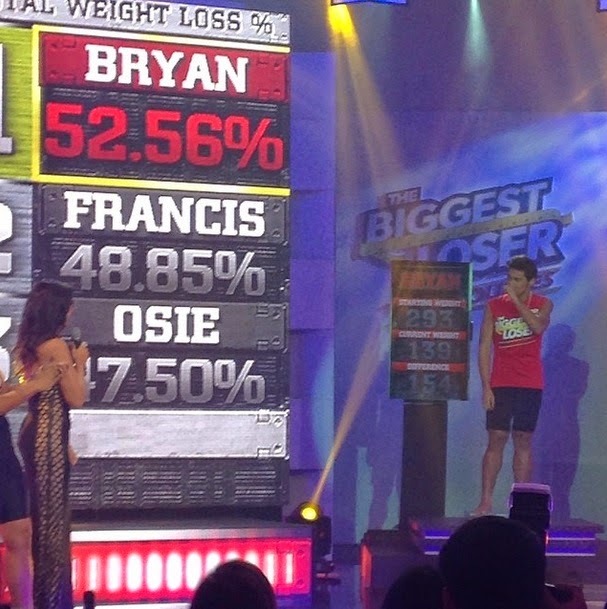 The final four of the reality show Bryan, Francis, Kayen, and Osie stepped on the golden weighing scales for their much-anticipated final weigh-in during the live finale episode. 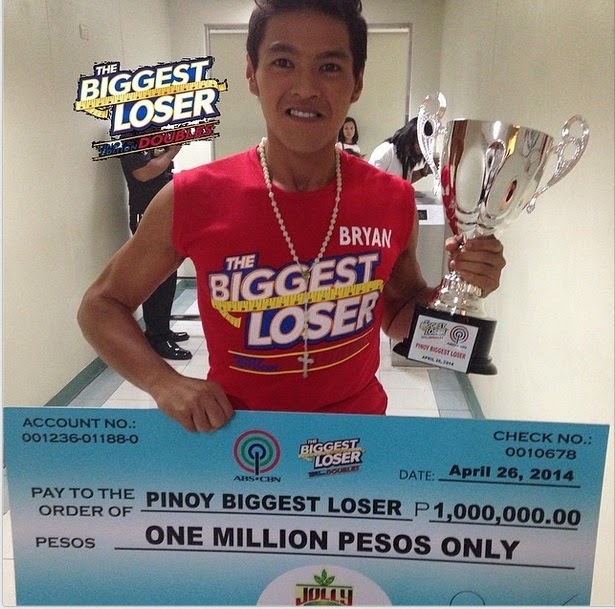 Watch: Bryan Castillo named Pinoy Biggest Loser Grand Winner (video courstesy of ABS-CBN Online). Host Iza Calzada became emotional on Mommy Osie during her final weigh-in as she lost 133 pounds from 280 pounds starting weight or 47.50%. Kayen received Php 500,000 as she got the Biggest Loser Doubles first runner up award. Francis was named second runner up and has received Php300,000 cash prize. Mommy Osie placed as third runner up. "We are very happy sa achievement ng contestants. Kung kaya natin, kaya nila, ay kaya din ng lahat," fitness coach Jim Saret said. 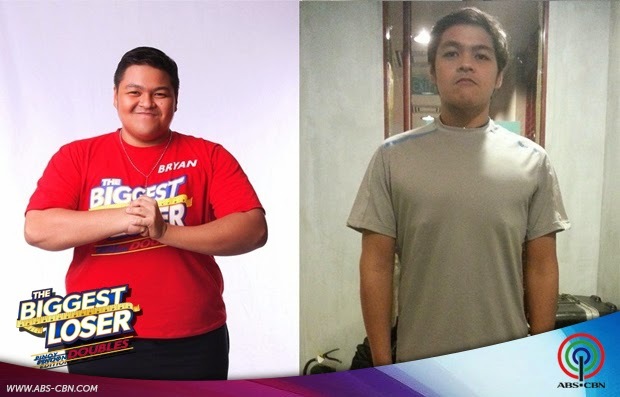 The transformation of Biggest Loser contestants became the top trending topic on Saturday with '#BigatingPagtatapos' and 'Congrats Bryan' dominate Twitter Philippines. Obsina Sisters, Francis, Kayen and Mommy Osie also impressed and inspired netizens on their new look. The Biggest Loser Pinoy Edition: Doubles is the second season of The Biggest Loser Pinoy Edition which is based on the The Biggest Loser franchise of the United States. The show started airing on February 3, 2014. The Biggest Loser Pinoy Edition Doubles was hosted by Iza Calzado, challenge masters Matteo Guidicelli and Robi Domingo, and professional trainers Jim and Toni Saret.